Combine all ingredients, except tomatoes, in a large measuring cup or mixing bowl. Place tomatoes in a resealable plastic bag and pour marinade over. Marinate at room temp for up to 2 hours, turning the bag occasionally. 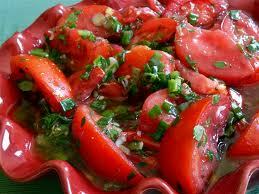 Here is another recipe for marinated tomatoes. Our family has made it for years. If you love garlic you will love this recipe. Fabulous! Slice tomatoes. I like to peel them by plunging them in to boiling water for 10 seconds and removing the skin but you don't have to do this. Pour over tomatoes and chill 1 hour.